RPS Engineering’s CH-Series hood assemblies are full 180° coverage and are hinged so they can be quickly and easily opened for inspecting or viewing the items being conveyed. They also allow for ease of repairing, replacing, greasing or inspecting of the idlers. 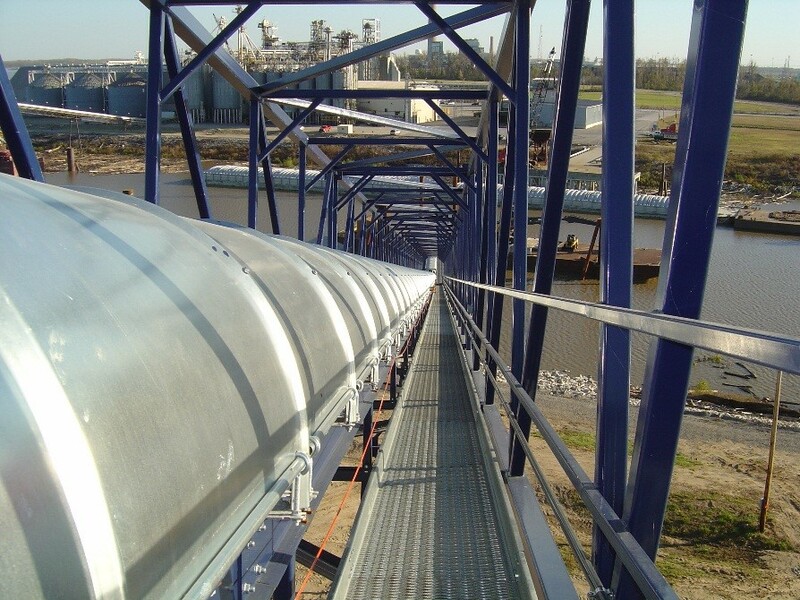 Conveyor hoods help to protect the belt, idlers and material being conveyed from the hot sun, wind, snow, rain and other damaging weather elements. Our standard CH Cover Assemblies can be made for 18”, 20”, 24”, 30”, 36”, 42”, 48”, 54”, 60”, 72”, 84”, & 96” belt widths. Custom sizes are also available. Standard covers are made from 22 gauge, G-90, galvanized steel with support bands made from 12 gauge, G-90, galvanized steel for belt widths up to 36” wide or 10 gauge, G-90, galvanized steel support bands for belt widths 42” wide and above. The assemblies come with heavy duty galvanized steel mounting foot brackets and a retaining bar to hold the cover in an open position for maintenance issues. Standard hardware is zinc plated. These assemblies can be made to accommodate 3’ through 5’ idler spacing with 4’-0” being our standard. If required, RPS is able to cut covers shorter for the special section(s) on your project. Optional cover and band material include Aluminum, Stainless Steel and our Fiberglass – CHFG series.